A lush update to old-world luxury, Inmod's Audrey Velvet Sofa offers a variety of vibrant velvet upholstery options without veering too far into over-the-top, ostentatious territory. With its fresh silhouette of fluid contours and graceful curves, the Audrey Velvet Sofa by Inmod grabs the attention without ever taking over your area's overall aesthetic, and also manages to incorporate classic comfort with its soft yet supportive memory foam interior. Bench-made by skilled craftsman for durability and strength. Refined yet relaxed modern styling. Available in an array of eye-catching hues. Padded cushions feature an added layer of memory foam for maximum comfort. Saw this sofa in multiple styles - big different was in the colors and the legs - love the splayed look! They weren't kidding when they said the cushions are ultra comfortable and the fabric is soft and creamy!! Seriously one of the most luxurious couches I've ever sat down on!! I was excited to find out this style comes in velvet!! I don't think i'll ever be going back to standard fabrics after having this sofa for the past week! BREATHTAKING in EMERALD GREEN!! Could not believe how gorgeous this color looks as a sofa - brought the PIZAZZ back to my living room style! Went with a more traditional color (gray) and I'm very satisfied with my order. Looks very nice with my new coffee table I also ordered. ProsOrdering was easy. Delivery was quick. 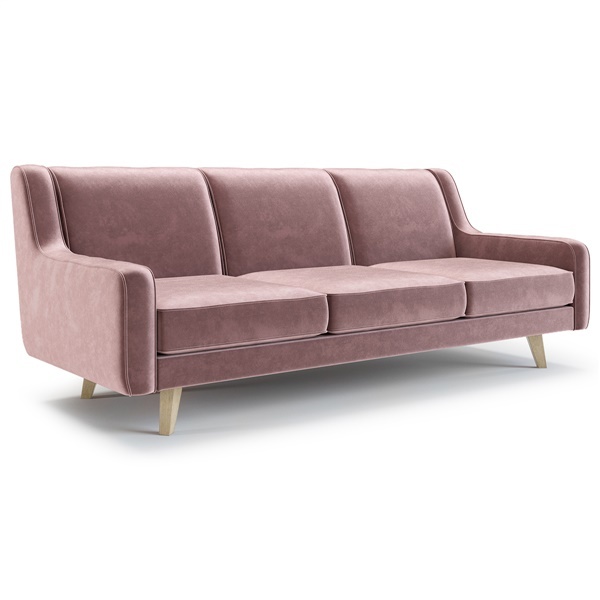 How cool is a pink sofa?! And even more so, a Pink VELVET sofa?! Really happy with how it looks in my space. Great color and very soft. Arrived quickly. Very excited. ProsColor and feel is amazing!!!!!!! Ordering furniture online can be a tough thing since you can't see it in person, but over the years I have come to trust Inmod and their customer service when it comes to my purchases. I was in need of a new sofa for my family room and figured I'd take a peek at Inmod. Once I saw this sofa I immediately knew I wanted it. I called to verify all of the measurements and once I had all of the information I needed (from their awesome customer service team) I took the plunge. I could not be happier with my new sofa and Inmod continues to be my go-to for furniture purchases. Thanks again Inmod! ProsColor was exactly what I expected and it fits perfectly with my decor. It gave my room a lift.